The TIM-LP is a tool for lesson plan review. It was added to the TIM Tools suite at the request of client districts. Several districts were using the TIM-O as a tool both for observing lessons and reviewing lesson plans. While the TIM-O could easily be used for lesson plan review, doing so resulted in a TIM-O database where observations and lesson plan reviews were intermixed. With the addition of the TIM-LP as a separate tool in the TIM Tools suite, districts can now observe lessons with the TIM-O and conduct lesson plan reviews with the TIM-LP, but not have lesson review data intermixed with actual observation data when they generate reports. This adds a great deal of flexibility to the TIM Tools suite, giving districts the ability to use any combination of observations (TIM-O), teacher reflections (TIM-R), and lesson plan reviews (TIM-LP) that works best for them. As part of a grant or project evaluation, both TIM-O and TIM-LP are used for formative assessment. As part of a grant or project summative assessment, every teacher submits a lesson plan at the beginning and at the end of the project period. After both sets of lesson plans have been received, all date references are removed from the plans and they are given to reviewers who use the TIM-LP to create lesson profiles for each. The pre- and post-project lesson plan profiles are compared as a measure of project efficacy. A district might choose to implement the TIM-LP for a period of time while they focus PD on integrating technology into instructional planning. A district might use the TIM-LP to reduce the number of TIM-O observations if the district is very spread out or there are other factors making frequent classroom observation inconvenient or costly. Many TIM-LP reviews can be made during the time it takes to travel and make one TIM-O field observation. A district might implement the TIM-LP with a small cadre of reviewers to check on possible observer bias in observations made with the TIM-O. To begin a review, from the Main Menu select Lesson Plan Review Tool (TIM-LP). The TIM-LP opens to the Dashboard screen. Figure 1. The TIM-LP Dashboard. The reviewer has access to all previous reviews from this screen. From the Dashboard, a reviewer can begin a new lesson plan review; edit, delete, or toggle the publication state of previous reviews, edit their own My TIM-LP Notes, or Download a Spreadsheet of previous reviews. To begin a new review, click New Lesson Plan Review in the TIM-LP menu. The review opens in a new tab and first gives the reviewer the choice of a Question-based or a Matrix-based review. The matrix-based review is usually the more practical choice since much of the question-based method depends on observable behavior that would have to be inferred from reading the lesson plan. After choosing the method of review, the reviewer selects the school from the dropdown School menu and then selects the teacher from the Teacher menu. Lesson plan reviewers have access to only those schools within their observer assignment. Figure 2. Selecting the method, school, and teacher for a new lesson plan review. A reviewer choosing the Question-based method, will be asked the same series of branching questions about the lesson as is included in a regular TIM-O observation. A reviewer choosing the Matrix-based method will be taken directly to a Matrix allowing the direct selection of levels for each of the five characteristics. When the TIM profile is complete using either method, the reviewer can select Notes and Comments from the TIM-LP menu to add a personal reflection to the report. Comments should be added to a lesson plan whenever possible. Constructive comments go a long way in positioning a TIM lesson review as a welcome coaching exercise rather than a teacher receiving a “grade” for a lesson plan. Of course, if the reviews are being conducted entirely for grant evaluation purposes and the results not shared with the teachers, there would be no need for comments. The comments field is also a place to capture additional information about planned lessons. A district might ask reviewers to note, for example, whether a particular piece of software is used. As long as the notations are made in some standard format (e.g. “NewApp=yes” or “NewApp=no”) it will be easy to compile the results from the downloaded spreadsheet of reviews. There are two sources that will help a reviewer when it comes to writing constructive comments that will benefit the teacher. Lesson Detailed Indicators. If formal comments are expected with each review, you may wish to copy appropriate sections of text from the extended descriptors tab and paste them into the notes field to give yourself a head start on comment writing. Just be sure to click the Save Notes or Save Comments buttons as needed before you navigate away to the Indicators section. My TIM-LP Notes. Every reviewer has a separate My TIM-LP Notes file available from the TIM-LP menu. Since new reviews open in a new tab, it’s easy to switch back and forth between the current review and the My TIM-LP Notes window. This is a great place to save some typical comments that you can copy here and paste into the Comments field of a review. The My TIM-LP Notes are available to you from any review you’re working on so it’s the perfect place to store boilerplate text for comments. Figure 3. Any text entered into the “Comments for Report” field will be included in the published report. Any text entered into “My Notes on this Review” will be visible only to the reviewer. Reviewers can add links to supporting artifacts on the Document Links screen. Any number of documents can be linked. Figure 4. The reviewer can add links to the lesson plan submitted by the teacher or any related artifacts submitted along with the plan. 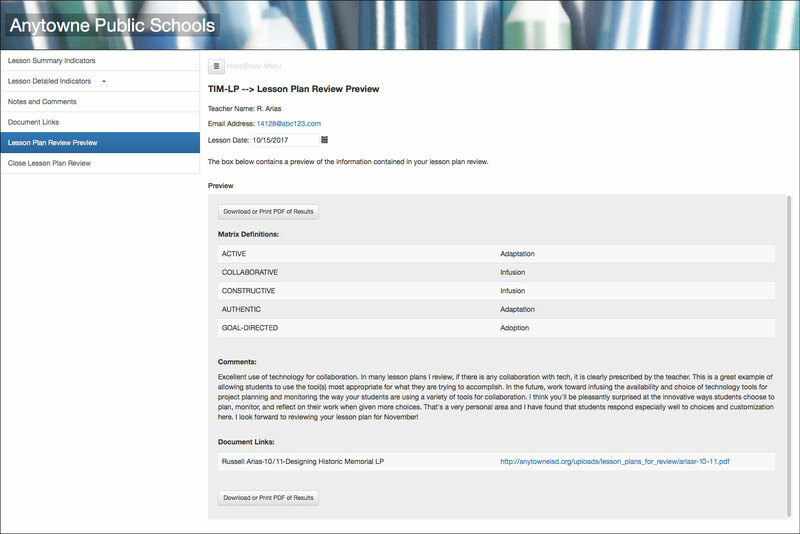 Reviews can be previewed from the Lesson Plan Review Preview screen. A Download or Print PDF of Results button is available for the preview. Figure 5. Previewing a lesson plan review. If the reviewer is satisfied with the preview, the Close Review button should be clicked to close the tab and return to the Dashboard. The new review will appear on the list of previous reviews with its publication status set to Not Published. If it does not appear, the browser may need to be refreshed. The review will not be available to administrators or be included in reports until its status is changed to Published. Any review on the list can be edited, deleted, or have its publication status toggled between Not Published and Published. Reviewers may use the My TIM-LP Notes field to record any notes to self. These notes are accessible only to the reviewer and are not included in any reporting. Reviewers may also select the Download Spreadsheet option to receive an Excel file of all their published reviews.